We don’t usually give out awards to real people here at Blogging.la (just fictional ones), but today should probably be an exception. 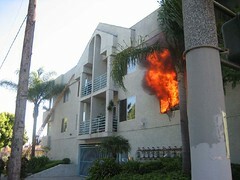 The LAFD blog recounts how a passerby saw a fire in North Hollywood and rescued a 92 year old woman in the building who was overcome by the smoke. They didn’t list his name. He was injured breaking a window to get into her unit, and the elderly woman, though suffering from smoke inhalation, survived. The responding Battalion 14 also recounts how they knocked down the blaze on their blog. Thanks for featuring our blog post. We agree with you (and Chief Williams) that the not yet publicly named motorist from Burbank clearly saved the day.